HTC isn’t a company afraid to try new things. In the last few years several of these haven’t panned out too well, like the HTC U Ultra’s second touchscreen, but the HTC U11 Life is a phone with a concept we can appreciate immediately. It’s a mid-range phone with an accessible price that uses Google’s new Android One program. This means you get an almost untouched version of Android, with the aim of getting much faster updates than other mobiles. That is, unless you're in the US, in which case you get HTC's Sense skin on top. There are notable shortfalls to match the cut-down price tag, like poor low light photo quality, relatively weak speakers and a body made of plastic. But it’s a solid choice for those on a mid-size budget. The HTC U11 Life costs $349/£349 (around AU$460), half the price of top-end alternatives and a lot less than the full-fat HTC U11. It sees it rub shoulders with the likes of the Honor 9, Moto X4, Sony Xperia XZ1 Compact and Samsung Galaxy A5. These are some seriously strong mid-range contenders which ensure the U11 Life won't have an easy ride. There are two main ways to view the HTC U11 Life. It’s a much cheaper alternative to the original HTC U11 that gets you a roughly similar experience, with some parts cut down to lower costs. 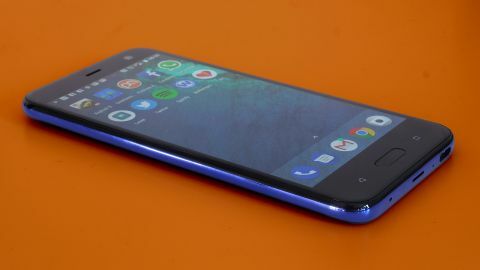 It’s also an Android One phone in most regions, meaning it uses the standard Android interface, making it a little like a Google Pixel phone not made by Google. Core elements it inherits from its bigger, more expensive brother include a shiny, curved rear and pressure-sensitive sides that enable gestures not seen in other phones. This is HTC’s attempt to stand out. It may not change how you use a phone, but HTC has made it customizable enough to let you dig deep and make the feature your own. Cost compromises are, for the most part, not too glaring. The screen is 1080p rather than ultra-high resolution, and the HTC U11 Life’s chipset is a mid-range Snapdragon 630 rather than a top-tier chipset. Major improvement in the graphics chip means it performs well in real life, though. As is common among mid-range phones, the camera can’t quite compete with the best in all situations. Great photo processing makes day-lit photos often look fantastic, but it falters at night and fine detail isn’t as sharp or clear as that of a higher-quality, lower-resolution sensor. The build isn’t quite on-par with the HTC U11 either. That phone has a glass back, the U11 Life an acrylic/plastic one. The biggest difference in feel is that while glass is cold to the touch when there’s the slightest chill in the air, plastic isn’t. You’ll have to decide whether that matters to you or not. After using the phone for a while the only compromise that we think might annoy some is battery life. While not flat-out poor, the Moto X4 and Honor 9 last longer between charges. The HTC U11 Life’s 2,600mAh battery is just not all that big. From arm’s length the HTC U11 Life looks a lot like the normal U11, which is a more expensive phone. The back is curved and shiny, reacting to light as if the stuff gets it excited. However, the HTC U11 Life’s back is made of “acrylic glass” rather than actual glass. And what’s acrylic glass? Plastic. There’s none of the cool hardness that comes with metal or glass, and as a result the HTC U11 Life does not feel particularly expensive. The Moto G5S Plus, Moto X4 and Honor 9 all feel more impressive. The HTC U11 Life’s build is pleasant enough, though. HTC has made sure there are no hard, flat surfaces. Everything is smooth and curvy, while the ultra-accessible 5.2-inch screen welcomes hands of all sizes. This is not, however, one of the new breed of phones with an ultra-narrow screen surround. There are a couple of blank millimeters to each side, and about an inch above and below the screen. It seems petty to make too much of an issue of this right now, though, when the trend is only developing, not quite the norm yet. Let your eyes decide whether you’re bothered or not. Other parts of the HTC U11 Life hardware are sound too. The phone has IP67 water resistance, meaning it can take being submerged, and there’s a good fingerprint scanner on the front. Some versions of the HTC U11 Life have an excellent 64GB storage too. Ours has “just” 32GB, but buy from HTC and you get 64GB. Ours is the European model, where the US and UK get the 4GB RAM/64GB edition. The hardware feature that sets the HTC U11 Life apart, though, is Edge Sense. This uses pressure sensors on the sides of the phone to enable gestures when those sides are squeezed. As standard, a quick squeeze launches the camera and a long one fires-up the Google digital assistant. However, Edge Sense can be customized too. It can zoom in Google Maps or Google Photos, snooze alarms, or answer calls. These are sensibly disabled as standard because HTC doesn’t want you to accidentally fire off these features and start thinking your phone is haunted. You can even create your own macros by going into an app and “recording” commands. We doubt whether many HTC U11 Life buyers will put the effort in, but HTC is clearly trying hard to squeeze the most out of Edge Sense. HTC introduced Edge Sense with the U11: it’s not an old feature. One omission may kill the appeal of the HTC U11 Life for some of you, though. It doesn’t have a headphone jack, just a USB-C port. A reasonable pair of USB-C earphones is included, but there’s no 3.5mm adaptor. The HTC U11 Life has a smaller, lower-resolution screen than the U11. However, it’s a punchy display that, in most conditions, doesn’t look much worse than any phone out there. It’s a 5.2-inch 1080 x 1920 Super LCD. There’s not too much brightness loss at an angle, and color is well-saturated without looking overdone. The image also appears very close to the top surface, a sign of an advanced super-thin screen architecture. You have to take the HTC U11 Life into a more extreme environment to see its limits. We’re not talking Bear Grylls fodder, just that you’ll see very slightly raised blacks in a darkened room, and the brightness is bright but not quite the 1000 nits of the brightest. That said, we took the phone out on a fairly bright day and the screen was still clearly visible. HTC’s website claims there’s a feature that lets you customize the display color profile, but it’s not in the software of our model.